SAN FERNANDO CITY, Philippines - The U.S. and Philippine navies concluded Maritime Training Activity (MTA) Sama Sama 2018 at Naval Station Ernesto Ogbinar, July 17. The week-long engagement involved Sailors and Marines from the U.S. and Philippine navies operating jointly in the air, on the ground, and on and under the sea. This year marks the 2nd iteration of the MTA series designed to strengthen the close partnership between the navies while cooperatively ensuring maritime security, stability and prosperity. In addition to a July 9 opening ceremony conducted aboard the landing dock ship BRP Tarlac (LD-601), U.S. Navy leadership met with Maj. Gen. Emmanuel Salamat, commander, Northern Luzon Command; Maj. Gen. Dela Cruz, air logistics commander; Rear Adm. Erick Kagaoan, Chief of Naval Staff; Commodore Nichols Driz, commander, Naval Forces Northern Luzon; the Honorable Aureo Nisce, acting governor of La Union; and the Honorable Hermenegildo Gualberto, San Fernando City mayor. "This past week challenged Sailors and Marines from both our armed forces to work together in a wide range of maritime operations that took place across Northern Luzon - in the South China Sea and in the vicinity of San Fernando City while also ranging out to conduct activities at Clark Air Base, Zambales and Manila," said Rear. Adm. Joey Tynch, commander, Task Force 73. "As a unified force, we demonstrated our ability to respond to any crises together as a capable and ready team. The tremendous work by both navies during this year's engagement truly reflected the spirit and energy of MTA Sama Sama - meaning together, jointly - and that's the teamwork approach we must pursue for effective maritime security." U.S. and Philippine ships and aircraft conducted nearly a dozen training evolutions in the South China Sea. 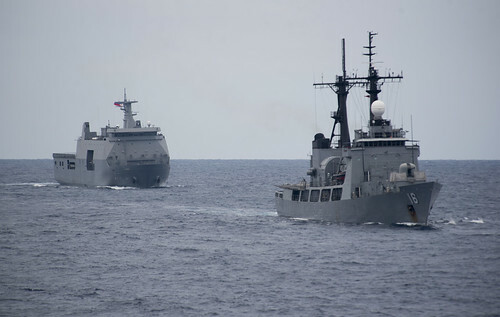 Division tactics (DIVTACs) with expeditionary fast transport ship USNS Millinocket, Philippine navy frigate, BRP Ramon Alcaraz (FF-16) and Tarlac focused on enhancing mutual capabilities to operate in close proximity to one another during a variety of cooperative maneuvers. Marine forces conducted joint live-fire training and medical evacuation (MEDEVAC) evolutions at Naval Station Leovigildo Gantioqui, demonstrating the full range of mutual capabilities. 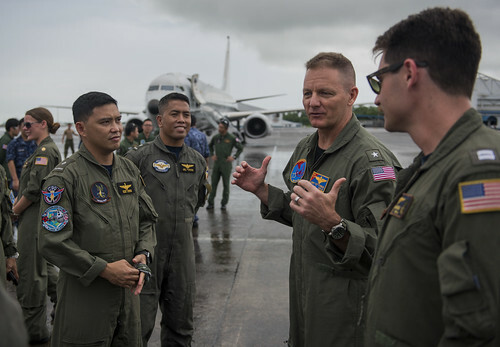 A P-8 Poseidon maritime surveillance aircraft supported a photo exercise (PHOTOEX) and orientation flights with Philippine Navy sailors to allow opportunities to share knowledge and experiences while operating the aircraft. The U.S. 7th Fleet Band’s Orient Express performed at schools throughout San Fernando City including La Union National High School and Don Mariano Marcos Memorial State University while Sailors from both navies played sports at Saint Louis College and La Union National High School.